We’re pleased to introduce today a new technology – Record Matching – that automatically finds relevant historical records for every family tree on MyHeritage! This is an add-on feature for SuperSearch, our global search engine for historical records, that was successfully launched in June. We’re very excited about Record Matching, and believe it is a breakthrough that can bring value to almost every user of MyHeritage and to people not using MyHeritage who are curious about their family history. Read the details below and we hope you’ll share our excitement. If you’re like many of us who love genealogy but don’t have lots of spare time to invest in it, you’ll love Record Matching. While you’re busy with other things – or even sleeping – Record Matching does much of the work for you. It works behind the scenes on a new server farm set up by MyHeritage, constantly comparing every family tree on MyHeritage to more than 4 billion historical records on SuperSearch, looking for matches to bring to you. A Record Match is a document relevant to your family’s history, such as a birth record of one of your ancestors, a tombstone photo of a relative in your family, or a newspaper article describing how your great-grandfather met and fell in love with your great-grandmother. Record Matches are found automatically and delivered directly to you. New discoveries await you! What’s unique about Record Matching? 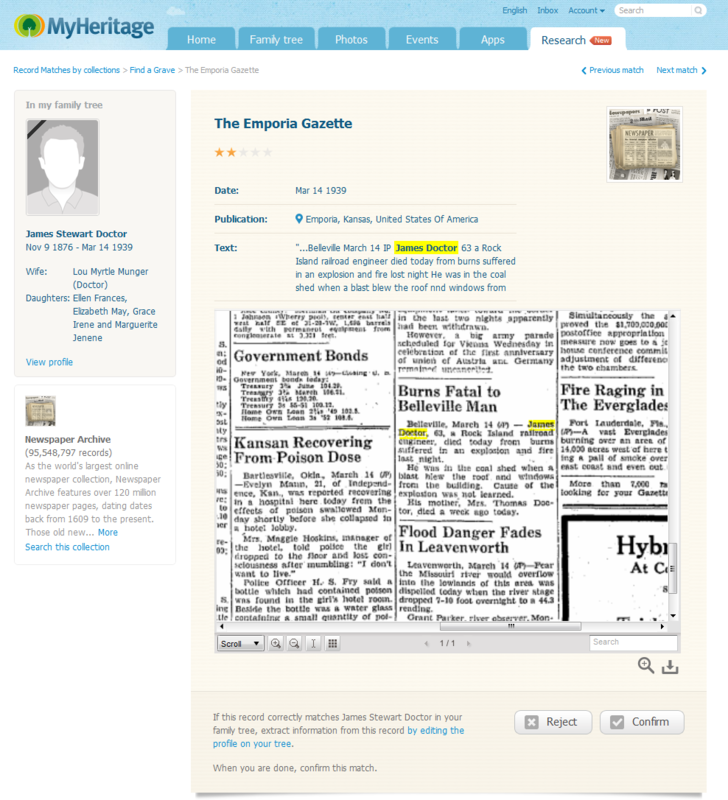 Record Matching is the world’s first and only technology to find family tree matches in newspaper articles, books and other free text documents, using semantic analysis. Based on the world’s largest historical newspaper collection dating back to the 18th century that we have under license, relevant newspaper articles found using this technology are incredibly valuable in shedding light on the lives, personalities and achievements of our ancestors. We call it “adding color to family history”. This is done in addition to matching structured data such as birth, marriage, death and census records. Record Matching is the first technology to translate names between languages, to find documents for you even in languages different than the one your family tree is in. The technology is particularly good with synonyms and phonetics, so you can expect matches ranging from the obvious (William in record vs. Bill in the family tree) to the subtle (Alessandro in record vs. Sasha in the family tree). Each match has a Confidence Score, ranging from half a star to five stars, indicating the likelihood that the historical record found correctly belongs to the associated individual in the family tree. Record Matching runs periodically in order to cover new individuals recently added or edited in the family trees, and to cover new data collections of historical records that we keep adding. 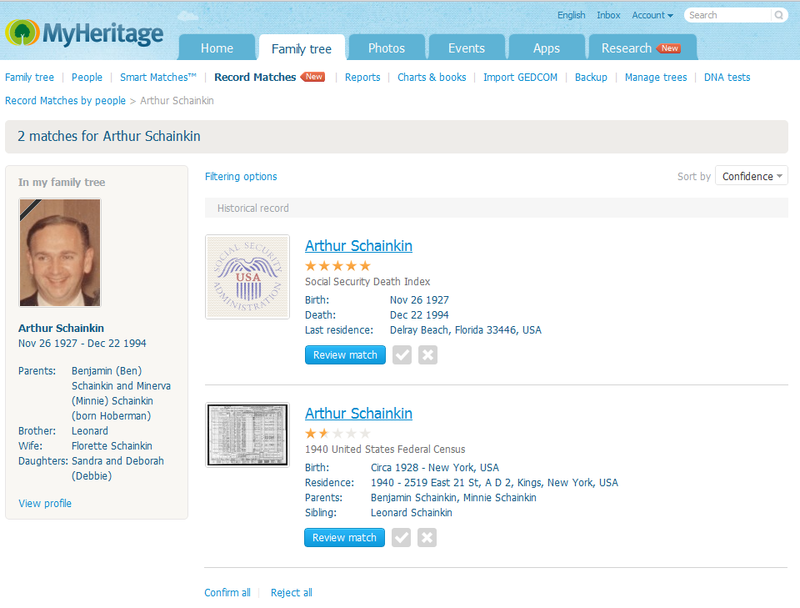 As you can see, Record Matching is another great family history research tool for MyHeritage users. If your family tree is on MyHeritage, we’ll continuously compare it – for free – to the billions of historical records we have, so that you’ll have a better chance to make new discoveries with no effort. The technology’s high level of accuracy will save time, and you won’t need to do a thing except sit back, relax, go through the Record Matches we deliver to you and enjoy the discoveries they bring. 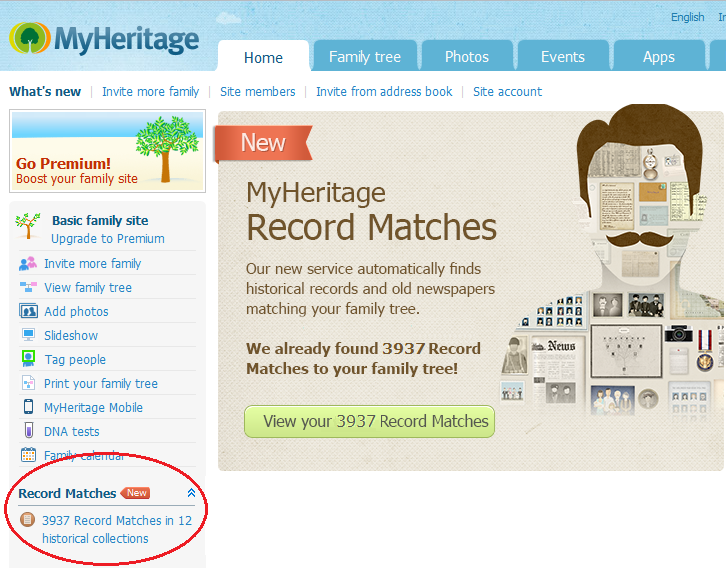 Record Matches are calculated automatically for all family trees on MyHeritage. 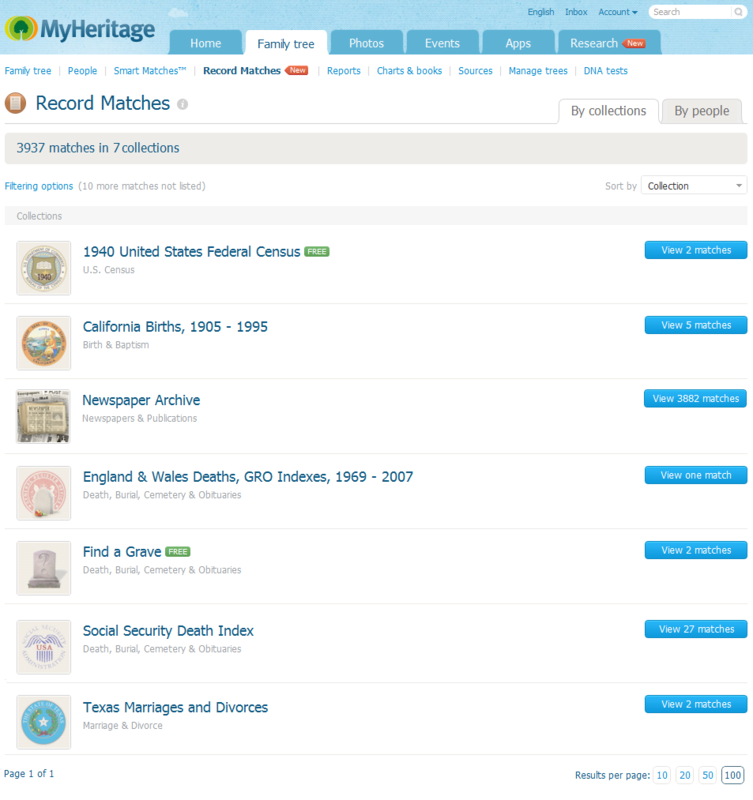 When you log in and visit your family site on MyHeritage, you will see a box on the side bar listing the number of Record Matches found for you. Click it to enter the Record Matches page. You can also access this page from the “Family tree” tab in your family site. The page for viewing your Record Matches allows you to go over them by person or by collection. So you can view all matches that were found for a particular person in your tree, or view all matches found for everyone in your tree in a particular collection, such as the 1940 USA census. Click the blue buttons to view the matches in any of the collections. We call this the “collection page” and it displays all Record Matches from one collection. 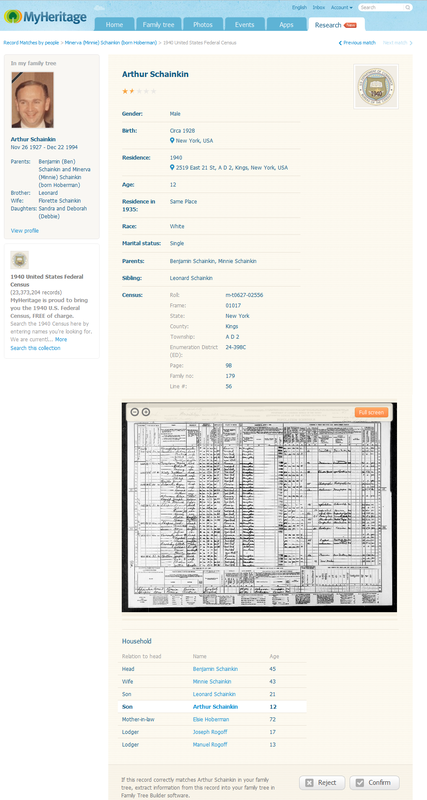 The information from your family tree is displayed on the left and information from the matching historical record, on the right. Click any “Review match” button to drill-down and see the full record for any match. This is displayed in the Record page. In the example Record Page below, the Record Match was an interesting newspaper article about a railroad engineer in the family tree. The date of death of this person was known in the family tree, but the newspaper reveals the unfortunate circumstances of his death – a coal shed explosion! This particular Record Match was found for Randy Seaver’s family tree (more on this below). 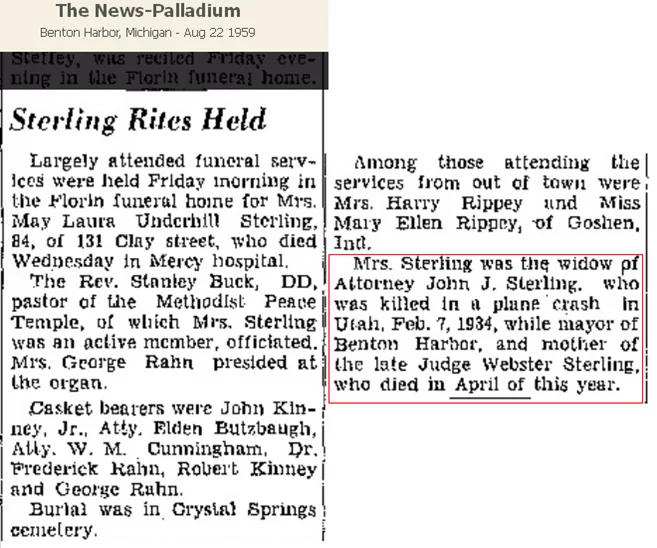 Note that you can save any newspaper article image and add it to your family tree by clicking the Download icon in the bottom right corner (shaped like an arrow pointing down). If you prefer, you can also go over your Record Matches by people, instead of by collection. To do so, click the “By people” tab in the top right corner. Click the blue buttons to view all matches of any of the people. We call the page that will open the “person page” and it displays all Record Matches of a single individual in your family tree. Information about this individual from your family tree will be conveniently displayed on the left side, allowing you to compare it quickly to the information found in the historical records. In the example above, the person has a match in the Social Security Death Index and another one in the 1940 USA census. Click any “Review match” button to drill-down and see the full record for any match. This is displayed in the Record Page. Shown above is a Record Match for a person in the 1940 US census collection. Our users can click the census image to view it full-screen in our special viewer. You are encouraged to confirm or reject the matches as you go over them, indicating that they are correct or incorrect, respectively. This can be done in the Record pages, Collection pages and Person pages. It is helpful as a way to mark matches you have already reviewed in order to easily work your way through the matches. Confirmed matches will have a green checkmark next to them, and you can later change your mind and undo the confirmation if necessary. Incorrect matches will move out of the way and become hidden from view when you refresh the page. Your feedback on the accuracy of the matches will also help us improve the technology. As shown below, you can set the filtering options to temporarily hide confirmed matches from view, leaving only the pending (unconfirmed) matches displayed. Before confirming a correct match, or shortly after, you are encouraged to extract the information from the match (scanned image, dates, events, facts, stories, etc) and add it to your family tree. At present this needs to be done manually in another window, as the first release of Record Matching does not include a save wizard for adding information directly from a match into the family tree on MyHeritage. 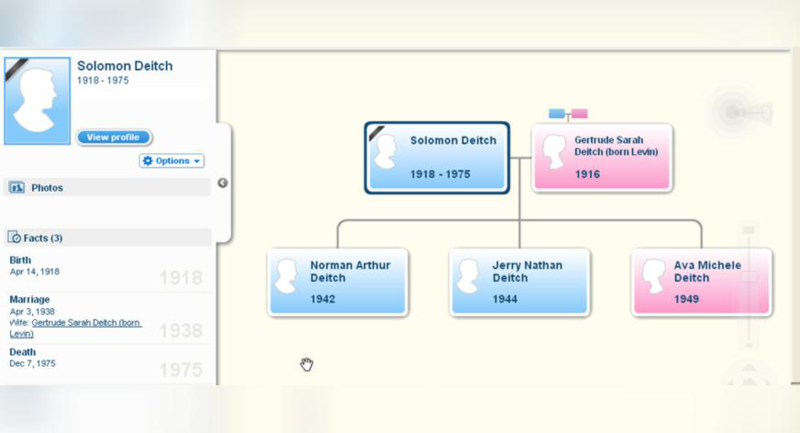 This, along with an option to create a source citation in the family tree with the matching record, will be added soon in the first update of Record Matching. We recommend that you create a source citation for any piece of information that you add to your family tree from a historical record, so you and other researchers will know later on exactly where you got it from. At the bottom of each list of matches you have the option to Confirm All or Reject all if you wish to apply these actions on all the matches displayed on the page instead of doing it individually. In the Collection pages and Person pages, you can click the “Filtering options” link. The following screen will open, allowing you to control which matches are displayed. You can use filtering to hide confirmed matches (thus showing you only pending, unconfirmed matches) and you can always bring all matches back by changing the filtering options. You can view only matches to structured records (such as vital records, census records), text records (newspapers and publications), or both. You can also request to display only matches with a minimum Confidence Score of your choice. Record Matching is highly accurate, but its accuracy doesn’t come at the price of finding fewer matches (i.e. only the obvious ones). Record Matches assesses the likelihood of each match being relevant to a family tree individual, and in the process assigns a Confidence Score for each match based on the degree of similarity of the information in the record (names, dates, facts, relationships, etc) to the information in the family tree. We have prepared an additional sub-system which we codenamed “Devil’s Advocate” which goes over the matches and reduces the score or completely rejects those that contradict information in your family tree, to reduce false positives to the minimum. 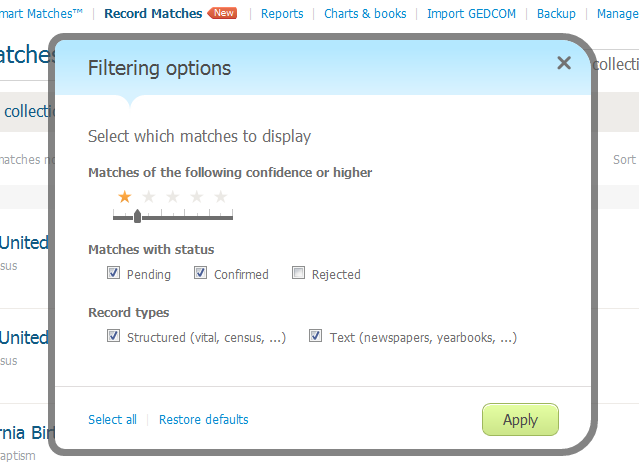 This Confidence Score, which is a unique feature of MyHeritage, is displayed next to each match and ranges from half a star to five stars. You can sort matches by score on every page, or filter matches by the score and look only at higher probability matches, or extend the scope to look at all matches, likely and unlikely. Please note an interesting conundrum: the higher the score, the less interesting the match might be! This is because a high-scoring match means that the historical record contains and matches a lot of information in the tree, hence your tree probably contains a great deal of information about this individual, so the new match may possibly not add much new information. There may be ‘genealogy gold’ particularly in the lower scoring matches where the system is less confident about the relevancy of the match, but that doesn’t mean the match is less interesting or brings less information, rather there may not be much information in the family tree about this person to lift up the score. You can visit your family site at any time to see the Record Matches found for you, including the latest ones. In addition, we’ll be sending our users a weekly email (depending on their preference) like the one shown below. The email will list new Record Matches that were found, and provide the option to review any match directly by clicking on the links provided. This is similar to the weekly email that delivers Smart Matches™. If there are no new matches to speak of, no email will be sent. Record Matching augments our flagship Smart Matching™ technology. Smart Matching™ finds matches in family trees of other users, whereas Record Matching finds matches in all other (non-family-tree) historical records. The two technologies work together in a cycle that constantly pushes forward your knowledge of your family history. As you collaborate with other users and enhance your family tree using Smart Matches™, Record Matching receives more leads and information with which to find more historical records, which in turn facilitates more Smart Matches™ with other family trees. For example, when you confirm a Smart Match™ for an individual in your family tree, with an individual in another user’s family tree, you are rewarded as all Record Matches found for the other individual automatically get applied to your family tree as well. There are many exciting sub-features and enhancements that couldn’t be included in the first release and will be added by us in the next few months. These include the ability to save matches directly into the tree, highlighting of matches that add new info to the family tree, real-time matches displayed immediately whenever a new person is added to the tree, and integrating the Record Matching technology into our profile pages and Family Tree Builder genealogy software. Please note that matches that are currently shown in profile pages and in Family Tree Builder 6.0 are not Record Matches, but are simple search results in World Vital Records. These will be replaced with real Record Matches very soon. 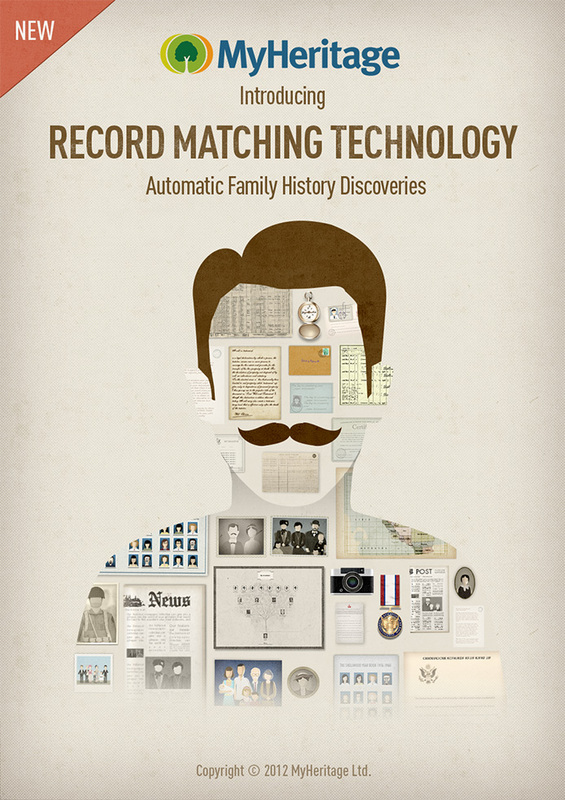 The new Record Matching feature runs for free for everyone who has one or more family trees on MyHeritage. Viewing the matches is free in extract (some information will be hidden), but viewing the full records and their scanned images or the newspaper articles requires a Data Subscription which is the same subscription used to view records on MyHeritage SuperSearch. For users who prefer it, pay-as-you-go credits may be purchased to view specific records in smaller quantity, in lieu of a subscription. Credits can be used to review a few matches of high interest, but if there are a great deal of interesting matches, a Data Subscription is a more economical way to review them all – see details on data subscription and credit options. A Data Subscription provides unlimited access to all records in MyHeritage SuperSearch and to all Record Matches. Some Record Matches, are always free and viewing them does not require payment of any kind. For viewing the full records, users are referred to the free website. 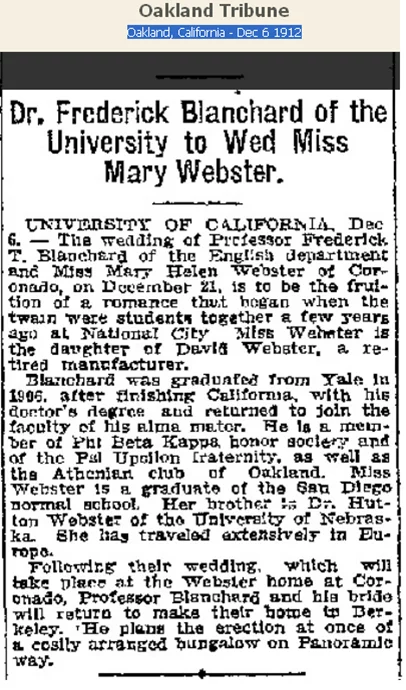 Randy knew that Frederick Thomas Blanchard, his first cousin twice removed, had married Mary Helen Webster in 1912. Like all Record Matches, this match was found automatically. Here’s another example from Randy’s tree. Laura (below) has no children and not much is known about her husband. With automatic Record Matches, Randy discovered that she was the wife of a mayor who died in a plane crash! The article also mentions that they had a son who was a judge, a fact missing in the family tree and now the door opens to find out more about this previously unknown person in the family. Finally, here is an example of an unexpected discovery found for the family tree of MyHeritage founder & CEO, Gilad Japhet. In the tree we see his relative, Gertrude Sarah Levin, who married Solomon Deitch but little else is known about them. The Record Match was a newspaper from Kansas in the 1930’s. It includes their wedding photo. The bride is beautiful. The caption is intriguing: “Love needed no words”. 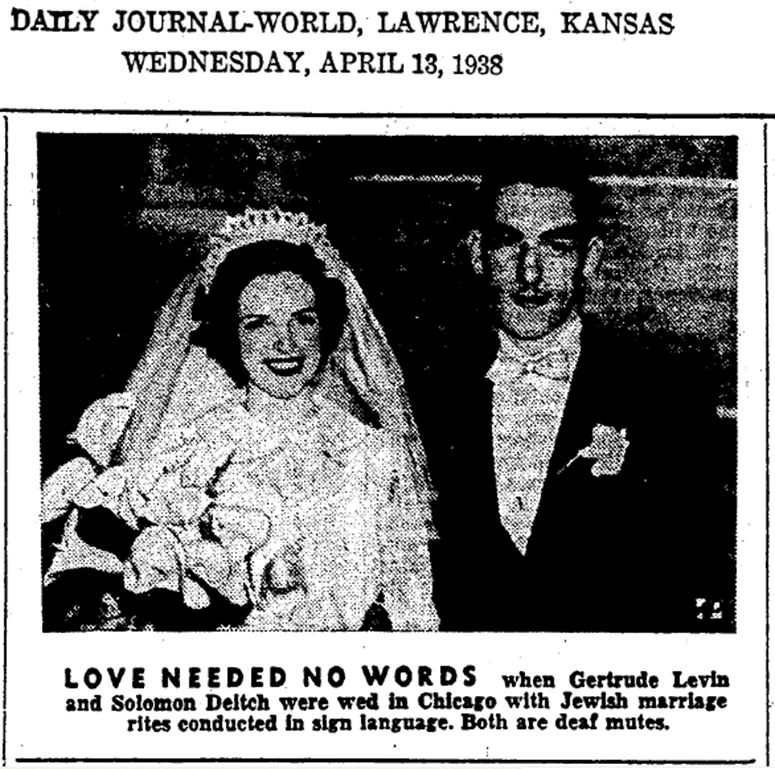 It turns out that the marriage service was conducted in sign-language as both were deaf mute… Another great example of how Record Matches adds color to what we know about the lives of our ancestors and relatives. 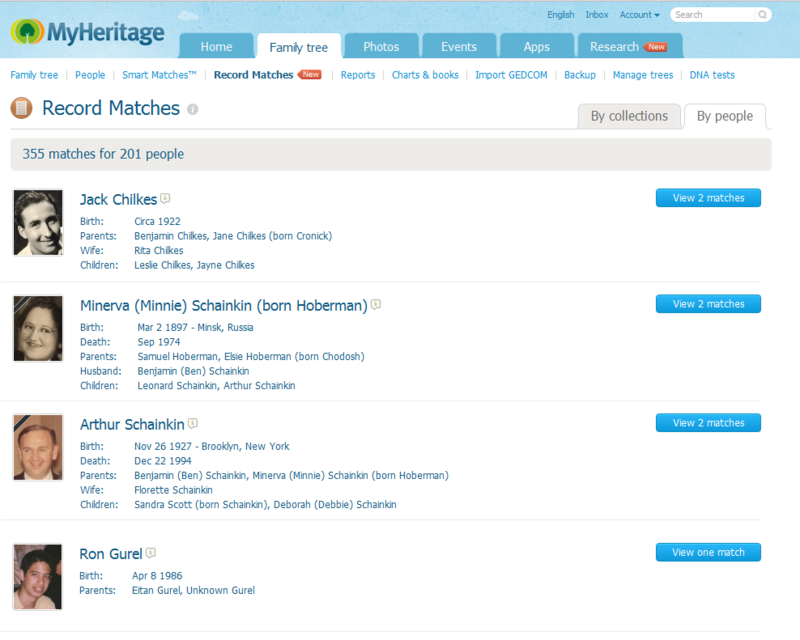 These are just a few of the thousands of Record Matches found for Randy’s and Gilad’s family trees, and in fact of the hundreds of millions of Record Matches that we have already found for our users, which are available as of today on MyHeritage. Wondering what Record Matches we can find for you? Check your family site now to see what discoveries are already waiting for you there. If you’re using our Family Tree Builder genealogy software, be sure to publish your latest family tree to your family site on MyHeritage, in order to have Record Matches calculated for you. If no Record Matches were found for your tree yet, worry not, all you’ll need is some patience. Record Matching works continuously and new data collections are added daily. We will bring the results to you automatically once found, and we are specifically working on adding data collections for non-English speaking countries. If you’re not yet a member of MyHeritage, you’re more than welcome to sign up for free at MyHeritage, import your family tree or build a new one using the site’s friendly tools, and receive your matches in less than 24 hours. We’re delighted to invite you to a webinar about Record Matches in which we’ll go step-by-step through the process of accessing and reviewing your matches and explain how to use the information to add family members or details to your family tree. Please visit the webinar registration page. We look forward to hearing your experiences with Record Matches and welcome your comments below. This will be a very great help to us all. I really appreciate all of the hard work that Myheritage has done for people like myself discovering family. Thanks for the great service you have provided! The info you sent me was very US centric. You might note that my family tree is strongly UK, Australia and New Zealand. Hope to see some greater focus on these areas. We’re constantly adding more data and records which means you’ll be enjoying Record Matches for different countries soon. This will be done automatically, meaning that when the data is added, you’ll automatically receive an alert if there’s a match. Also, when you add more people to your family tree, the system will check for their matches too. Amazing I am sure this will Help a lot of People to Research their Ancestors. Love the way you can add pictures from other family trees. Also, the grave sites are a plus. How effective is this in my home country, New Zealand? Hi Gavin. Hopefully your matches will give you that answer. As mentioned in the post above, there is more data being added and so you’ll see even more NZ matches going forward. It really is a great help. I will pass it on to friends and family. I want help with “Indentured Servants”; at one time 70% of VA population were Indentured Servants. I can’t find anyone who is interested in this population. I have several books on the subject and my mother’s maiden name is listed on several ship’s list. But I don’t know how to conduct a search from ‘here to there’. Can you help? Would you have access to South African records, plus records of Irish or other Europeans who immigrated to South Africa? Your records appear to be only for America. It has made me very happy. I can see that it will help find more info on the family of yesteryear with the family of today. Does anyone in Clifton Bedford now the history of Thomas Robets and his wife Margaret Roberts (nee Dear) and would they ahve any information of the Dear Family of Clifton Bedford and the Cooper family from Henlow Bedford. My father’s name was Josef (Yoshka) Grun (pronounced as : Green) ‘ and his father : Emanuel. My grandmother was Teresa Grun (formerly : Steinschreiber). They lived in Sarospatak (pronounced : Sharoshpotok) Hungary , untill 2nd world war. Teresa was murdered by the Nazis . I know that there were relatives , from Teresa’s side : Stein family , that lived in New-York City , and they were in contact with my father Josef Grun – some fifty years ago. Wonderful news, now I can go back and do more research. Thank you MyHeritage!! This is a great addition to my heritage. Looks great would be of good use i’m sure. This is a great addition to MyHeritage. It will help solve some mysteries. This sounds so good. I will definitely try it. This is going to be a wonderful thing for those working on their family trees. I am truly interested but due to circumstances beyond my control, I cannot join at this time. Thanks! Thanks this will help me to complete the family tree. That program is very good. It sounds great I hope I get time to use it! Wonderful but now I’d like face recognition matching to identify the wedding photo from around 1910 which might or might not be a family wedding with lost ancestors. I inherited this photo from my mother’s side. Could the bride be my grandmother or great grandmother or the groom be a great grandfather. Also who are the three people standing behind the bride and groom on a paternal family wedding photo? It is great, but the most members of my family live and lived in Europe (family Auf origins are from Czech Republich and from Germany and I want to know if somebody still livs there! )so I don t know if it is possible to find them with this new program?! This would be a very valuable service. Great !!! I’ll use it . Thank’s. I am looking for Elizabeth L Adams, born in London England in the 1800’s. Thanks for emailing this to me. At last! Have been looking with not much hope for a newspaper article which might exist of my mum being found as an abandoned baby, in Portsmouth. which she was, in the year of 1912. Hope I can understand this site. My poor mum. There would be nothing else, but there might be aforementioned newspaper article, mightn’t there? My mum’s name was Kathleen Buckingham. Foundling in Buckingham Road, Portsmouth in 1912. Hence surname, Buckingham. Heartbreaking. I am finding this tool as absolutely great. Thank you for coming out with it. I am looking for 2 people:- Joseph Winstanley Peek/Peak/Peake b 1821 Cheshire, & Joseph McGhie/McGee b about 1814-1816 Lanark Scotland. Hope someone can help. I am looking forward to apply it. I’ve just been wondering. I know that a few of my more distant relatives went to Australia and America but somehow I am not able to distinguish between Medić and Medic where the first is the correct spelling of my Surname. Will there be any way of finding out if any of Medic in the searches are actually Medić? Glad to have this program, keep up the fine info coming. I am scearching for records of the marriage of my paternal great grandparents, Richard Johnston and Anne Trevelyan mid 1800s and the birth of my paternal grandfather Richard Louie Trevelyan Johnston supposidly in 1866.Have no idear where . The accuracy was excellent in all areas except for newspaper articles, where it is very bad. Refining the criteria so that it is more restrictive might cause the program to miss some matches but this would be offset by making it more useful. There are 323 newspaper article “matches” shown for my tree, most 2 stars or less. A few of them are valid but it is very time consuming to find them. That said, Record Matches is a big plus for your members. Thanks Glen. As you mentioned, we don’t want you to miss matches and so the confidence score is there to help. Please feel free to change the confidence score to receive matches with a greater probability. I look for lost family named LEWINSON from Vilno Polin or Litau brathers of my grand father Pesach Lewinson in USA. Olso looking for Elisha VARSHAVSKI BORN IN ISRAEL TEL-AVIV the son of MIRON and BUNIA. this is looking very interesting. Nagyra értékelem az új szolgáltatást és ennek a munkának kidolgozóját. Köszönet Neki. Köszönöm az első találatot melyet ezen módszer segitségével kaptam. További sikeres munkát kivánok Önöknek. I didn’t understand it all, but probably would with use. maybe too much info. Thanks for the valuable information on family records. I start to build my family tree and I find it very interesting. I have already 254 family members on My Heritage Tree. Looks like it will help a lot. CAN’TWAIT TO SEE WHAT HAPPENS! As the different branches of my family originally moved from UK to Australia back in the 1800’s I am hoping to be able to go as far back to their origins as possible. Hoping that with this new tool I also will be able to find more information on our UK relatives, as as far as I know I don’t have any family members in USA. Although received a little while ago, I have only now started to read it all. By crikey it sure sounds great! I’ll soon re-read and get to commence it fully. Thanks to the MyHeritage TEAM! Cheers, Terry Lynch -Aussie. I am very please with the Clements Web Site. I am looking for Carl Johan Frederik Broberg born sept 20 1863 in Sejlstrup, Hjørring. Left Denmark febr 25 1903 for Omaha, Nebraska with the ship “Norge”. Does anyone know anything? Looking for Hampton ,Keen,& Morris family from Miss. & Ky. So far I have managed to track a direct line back 11 generations into the 1600s however I too find it difficult to search for matches in Aus and the UK from your site as even when I list Countries, D.O.B, Death etc it still gives me alot of American information that doesn’t match up with my records at all. The only other record I have found during a search that matches anything of mine is another members online tree. I know you say you are adding more information soon Aaron, and I look forward to it as your program is a real help to keeping track of everything in an organised fashion and it would be fantastic to have access to documents to fill in the blanks. I am so very, very delighted to find your site and your added features. I am 80 yrs old and trying to get all the history I can as quick as I can. Liveing on Social Secuity I do not have the money for all the other sites. You seem to have all the info I need and most of it free. Thats the price I need. Thank you so very much for what you are allowing me to accomblish. I like the record matches very much, I would like to know how I can copy them to my tree. I am looking for COSTA LEOPOLDO or COSTA ALBINO(brother) borned in 1879 at Lombardore , Italy and lived in San Francisco in Grant Avenue or Montgomery street(1921 at least 1930), arrived with the ship “Colombo” from Genoa to New York. Does anyone know anything? Absolutely fantastic – I have had over 950 matches with this system and was amazed that they were ALL valid. Truly a great addition to your already wonderful site. I started in 2008 with MyHeritage with just 2800 relatives and now have over 14,000. Thankyou Myheritage, at last there is Records that I can relate to and they have been invaluable to me especially the Deaths for England and Wales between 1969 and 2007 on the GRO index’s. Keep up the good work and keep these records coming in. I would however like to see Marriage Records because they make the families accurate. I am with the Genealogist and have got a lot of info from them. How about Wills from 1858-2000 in the UK. Would it be possible for Myheritage to retrieve these, I wonder?? A job well done Myheritage. I’m looking for information on AMALIE STUTZMANN FROM GERMANY. The matching seems to be pretty accurate. Many multiple hits in the newspaper section makes it more difficult to find unique pieces of information. Once a match is confirmed, will that data, particularly the image of the information, remain available to all members? If I stop the service will I lose all of the contections to this information too? Hi Russ. Once you confirm a match, that data will still be visible through SuperSearch, but not on your list of record matches. We recommend downloading the image, and extracting and adding all the information to the relevant profile on your family tree. Very nice addition to the already great service you provide. I like that the searching is already done and I just have to check it. So far only one or two rejections out of hundreds I’ve checked. Only one suggestion so far: pair up the marriage records. I don’t need a match for both husband and wife separately. Ищу родственников деда Атвасит Бруно Иванович , который родился в Латвии ,Лифляндской губернии ,Валкского уезда ,с Новогульбинское в 1881 году, в 1916 году был ранен на фронте и отправлен в госпитль в уральский город Камышлов. Там он женился,так иостался на Урале. В 1938 году был взят по стражу,его увезли ночью. В книге памяти Свердловсой области написано ,что он расстрелен 24 октября 1938 года.Но у меня имеется справка о егореабилитации и свидетельство о смерти ,где указана дата смерти 11декабря 1943 года Диагноз Бронхиальная астма Мне хочетСветланася узнать о своем деде подробно. I am looking for relatives of my grandfather Atvasit I. Bruno, who was born in Latvia, Livonia, Valka district, with Novogulbinskoe in 1881, in 1916 he was wounded at the front and sent to the Ural city gospitl Kamyshlov. There he married, so iostalsya the Urals. In 1938 he was taken to prison, he was taken at night. In the book of memory Sverdlovsoy subject have already written that he be shot goda.No October 24, 1938 I have a certificate of egoreabilitatsii and death certificate where the date of death 11dekabrya 1943 Diagnosis Asthma hochetSvetlanasya I know about his grandfather detail. Matching is a good feature. It has helped me fill out details and also close off some faulty memories. 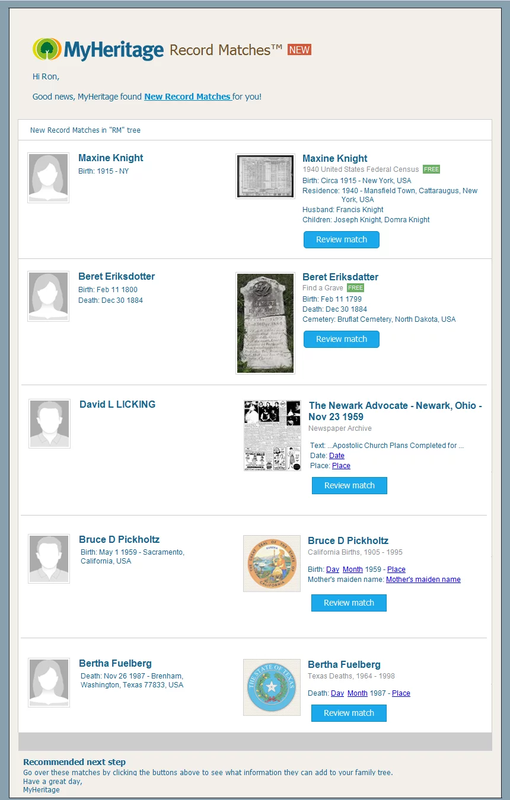 By combining the feature with free online searches of basic information available on some births, deaths and marriages I have been able to fill out more of the family tree. korespondovalo slovo zápis nebo záznam.Možná že se mýlím a obtěžuji Vás zbytečně a vto případě se omlouvám. Hopefully this works as well as I heard. I’d like to be able to cut and paste articles and obits into the notes section for the person – instead of transcribing onto paper and then typing into my tree. Hi Chiquita, we are working on a merge facility to make it easier to add the information to your tree. Meanwhile, you can also download the records if that helps. Thanks. I am interested of Record Matching Technology. I am impressed with the response this year. Makes me want to add to my family tree,this is going to be great. thanks. a lot of robert lee carters thanks. IS THIS A MATCHING FAMILY TREES WEBSITE ONLY? OR DO YOU HAVE CENSUS RECORDS AND SUCH TO OBTAIN INFORMATION? BECAUSE WHAT IF NO ONE ELSE HAS EVER DONE THE GENEALOGY ON MY FAMILY, WOULD I BE PAYING FOR NOTHING? Hi Irene, you can use MyHeritage’s family history search engine – http://www.myheritage.com/research – to search over 4 billion historical records including census records and newspaper articles. I am looking for information on George W. Kinnis & Lula Lee Riley on my Father’s side of the family. He was Robert O. Kinnis and married Hildred I. Banks from Rosiclare, IL. George W. Kinnis was from around Lyon County, KY. Robert and Hildred lived near Marion, KY., Crittenden County. They have one daughter Barbara Jean Kinnis who married Carlin G. Cook. Carlin & Barbara live in Paducah, KY. (McCracken County). They have two children Stanton (Stan) C. Cook and Lisa J. Cook Dawes. On my Mother’s side – Arthur Delbert “Deb” Banks who married Dena Day. They had four children Ethel Mae Banks Lane, Arthur Banks, Cecil Banks and Hildred I. Banks. In Deb and Dena’s early years they lived near “The Garden of the Gods” in ILLINOIS. After Dena passed away, Deb moved his children to Rosiclare, ILL.
We are also looking for the old family Bible that was left in the drawer of a chest some 60 + years ago. We would be so thankful to find this family treasure. Arthur married Margaret Harnice and they have one son Ronald Wayne Banks, who lived in Lyon County, KY.
We are interested in any information about Virgil E. Cook, Sr. who married Syble G. Thomas. They lived near Tolu, KY. in Crittenden County. They had two sons, Virgil E. Cook, Jr. and Carlin G. Cook. Virgil married Linda L. Shaffer and Carlin married Barbara J. Kinnis all of Crittenden County, Marion, KY.
Heather Muriel Mitchell April 15, 1939. I was born at the Royal Victoria Hospital, Montreal, Qc. and adopted when I was one day old to William Gordon and Muriel Gladys Mitchell of Montreal, Qc. Is there anyway to find out my real parents or one or the other. Thanks so much for all you do. Iam not that good at this but I am trying. If I can get better I will become a member. I’d like to be able to share this with other family members. I want to trace my heritage back 200 years. Can you advise me .? my name is clyde e palmer and im trying to find my chereokee roll number on the palmer side can someone tell me how to go about it? thanks my granpows name was john william palmer pased away around1930 to 35 im not sure. Is there any relative of mine in Florida? You can try our online database of millions of historical records, SuperSearch,. I would recommend trying to find records specifically by country/state/city, by entering the information you have, which will rearrange the results placing the most relevant to the location first. Hope this is useful, and good luck! Fantastic.Thank you for the reminders specially Importent events notify correcttly. I love this Heritage site. Will be using it more in few days. Mainly looking for info on my mother’s Mom. Her name was Josephine Ethel Rita Tallon (MARRIED name WILSON). My mom is RUTH IRENE (WILSON) ROSS, her sister is GEORGINA (WILSON) DURST and their brother was DONALD FRANCIS WILSON now DECEASED. I am searching everything about Schönfeld´s family. Originally Northern Bohemia. nowadays Czech republic. I like it too. Saves me time! As a slow typist, I look forward to the updates you mentioned. Looks like a great service! when my personal time will allow me to delve further into my family history. impregnated. That maiden was my great grandmother as told by my mother Guadalupe Velasquez born in Trinchera, Colorado. So being 1/32nd (I think) Apache if you see me half drunk and running around with a Tomahawk, “RUN !” Mother born April 20th, 1884 on that ranch where they raised ‘Racing Horses’. Sounds like a great improvement… I will check the latest matches in your email to me and probably sign up for the matches. Are you related to Michael Nichols, and Naiomi Nichols who lived in Little Rock, Arkansas, and Michael was also known as Make Nichols as a nick name I was told, and he owned a lot of land, and a General Store in Little Rock, Arkansas? Please contact me if you are related to Michael Nichols my Great Grand Father, or Naiomi Nichols who my Mother was named after her. search each village until you find your family name. I am looking for information on my grandfather Anderson. He was Robert Walton Anderson, my mother Anne Christina (Jean) married Snell ,. Was born about 1858 came to New Zealand from Edinburgh about 1870, went to Dunedin to live with an Uncle. We dont know anything about his family. He married my grandmother Christina Merrick in 1898, she was only 18 he was 40. They went on to have 8 children. Mum was 3rd to last. очень хороший сайт! с его помощью надеюсь вастановить все родственные связи!! where did the “Fathers” surname originate? I’ve found over 250 family members to date. I’ve been going through the information and comments and am so interested in finding my family history. Hopefully, you will be helpful in finding the Britton family for me. I know a bit more. I will try to fill in what little I know now. Thank you for this site. I believe it will be helpful as My sister, Ruth and I are the last in this Britton family. Been using this for while and I really like it. Have found a lot of info on relatives and have put on mine to improve on. Have been able to help confirm info I had parts of and hope to use this a lot more. I am just starting to delve into our Jaffray , and Hooton family trees ,and once a basis is established , I will start using records etc. You can choose to save a record match, and then to only extract sepcific pieces of information that are included in the record. I am the mother of Michal Henrietta (Sheshinski) Avital. I never wrote that she was born on a date which was not checked perfectly. There is a problem with US date writing and European date system. I wrote November 8, 1967 (in my country DD/MM/YY) and the editor of the tree building changed it to (MM/DD/YY, 8/11/1967). It was, is and will stay NOVEMBER 8, 1967. Please help me to correct it in all the TREES I started. Good going. It will be like flying on auto. I’m excited to find my relatives from the past. So far you’ve been a big help. 10/21/2014: THANK YOU FOR MATCHING AND VERIFYING THE INFO FOR MY FAMILY. I HOPE THAT IT WILL BE OF VALUE IN THE FUTURE TO MAKE TIES WITH OTHER EXTENDED FAMILIES THAT ARE DISTANTLY RELATED TO ME. Has anyone have any information on Charles Nye Woods Born 1808 in Hadley, Hamshire Co., MA and married (Elizabet or Hepsbeth Southwick) He died in 1876 in Winona, MN. I am a part of the Nye linage to the Mayflower through him but I am stuck at Him. I could use some help because I am going to get a Grand son and would like to pass the nye down. Looks helpful, now to find the time to implement. As I am new about genealogy reading all about Record Search etc. makes me very anxious to find new things about the people in my family. Loving it, don’t know how to add record matches to the family tree yet. I am pleased I have come across this site. Can’t wait to discover more !! hope there will be more innovation and development. I keep trying to find information about my father,Wallace AJ Lereaux, and I dead end at his parents. Can’t get any futher. Please if any body knows of this name, it would be helpful. As I am the last living Lereaux. Thank you in advance for time. We have millions of global historical records, including those from Australia. I would like to use this service in order to find out more about my fathers side of the family of which I know very little. After my fathers passing in1962, my mom had very little contact with all of my fathers siblings and Thier families which was quite extensive. So, I have lots of relatives, cousins, 2nd cousins, 3rd cousins and so on who I don’t even know. I am into this.It is great. Does this include any records in Ireland or Germany? Yes. We have records worldwide, which you can search by country. Thanks for the record matching. It helps to keep my records straight. Thanks to Smart Matches, I found that one of my ancestors, Robert Moses, was George Washington’s tailor. Now if I could only find my paternal grandfather, Ira Lionel Matticks, who disappeared in the late ’20’s or early 30’s, during the Depression. Where do I learn how to use this site? I am confused about accessing this site? You can start a free family tree by visiting http://www.myheritage.com and start entering your family’s details to start discovering more about your family history. Feel free to check out previous posts on this blog where we post webinars, tips and more to help you get started. Have already made contact with relatives I didn’t know I had and added over 40 people to my family tree and discovered a lot more details of some I already had and I’ve only been a member for a couple of months. Thank you My Heritage. Sounds like a great idea. I am very interested. For a first impression this looks like a great addition. Looking forward to interaction. I am looking for a French ancestor, Francois Dupont, who settled near Bislich, Germany where he had a son who was born in 1803 and was called Franz Dupont. Franz married Margaretha Gissing who was born in 1806. How and why did Francois come to Germany? Where and when was he born? What was his wife’s name etc? I hope you can help. Thank you. Would like to know how much it cost. This all looks very interesting and may fill in a lot of unknown areas for me. Looks like a great site. Will need time to digest all that it offers. Je to krásne nájsť kontakty z celého sveta a z množstva rôznych prameňov. Pouvažujem o rozšírení. of services’ I purchased with my annual subscription to myheritage.com. So far, I’ve found it to be helpful. Looks like a great service for us….I look forward to seeing some info for me about my family on this in the future. Each day week and month I find out something new,I enjoy doing the family tree. 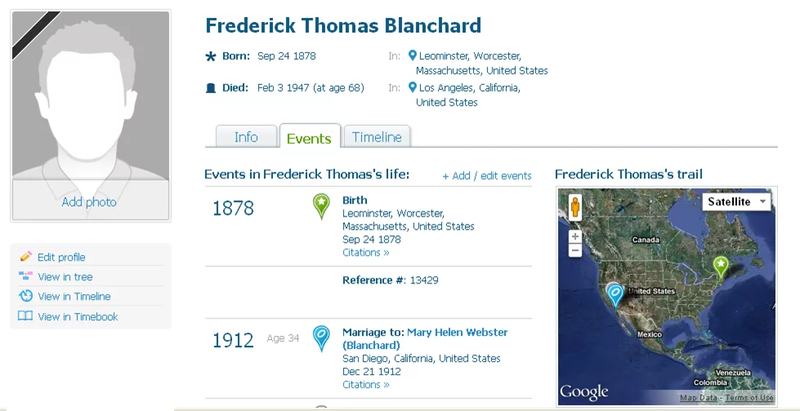 If you wish to research 8+ billion historical records and content offered in the Supersearch, explore the collections, make use of the features such as Record matching, the Record Detective and add family tree profiles to your tree from historical records, a Data subscription is an excellent choice.